The picture below has been tweeted this morning, so whether this represents a new release on the part of Rowan Atkinson, or someone has chosen to highlight something that he produced a while ago, I am not sure. However, following his high-profile appearance at the Olympic opening ceremony, it is a canny move for this to be released now when his name (or at least that of Mr Bean) should enjoy such widespread public recognition around the globe. Atkinson is a well-known advocate of free speech and has made a number of criticisms of so-called "hate laws", a stance which can only be commended. As for the sentiments voiced below, I am in complete agreement. 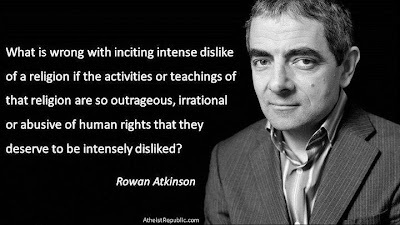 Now, which religion could be described as the one that we should most dislike based upon Atkinson's quote? Nominations please! Any ideas about which of the three Rowan actually meant? Presumably he values his safety and that of his family too much to be any more specific. Let's hope more high-profile celebrities have the guts and sense to join in the debate. I get the feeling that it is highly unlikely that he is referring to Buddhism, and rather has in mind a religion that is unfortunately seldom far from our minds these days, owing amongst other things to its shrill and aggressive intrusion into our country. Does it deserve respect? Not at all (although it would seem to have taken over the political party of the same name). Noooooo of course not, he said "IF", which means if the reader were to think that there might be a religion that is highly detrimental to human rights, abusive or highly 'indoctrinative', then they are in their right to dislike it! I don't know... do you hold impressions of any religions like that? Maybe you have a tendency to thinking Islam is like this... Shame on you! A couple of quotes from Anne Coulter, the American commentator, are of note: "The Ahmish have been quiet lately!" and "Oh, go get a camel." referring to the 'magic carpet' I suppose. Of course these lines were used in a talk on _____! Hey, I'm safe in Canada, at least for the time being. Rowan was being circumspect and had no wish to be charged under Section 5 of the Public Order Act or the Crime and Disorder Act as some have been, including myself. I know of no other religion which comes even close to Rowans description...... ONLY ISLAM DOES.